As the SxSW conference has grown in popularity, so has its influence. All around Austin for a week every year, techies wander around glued to their phones and listen to each other expound on technical minutia. Over the past few years, companies launched at SxSW have gone on to much critical acclaim (if not always monetary success). This year, everyone’s been talking about Stickybits. Basically, they’re barcodes that let people attach digital content to real world objects. When scanned by the Stickybits app, any user can see that content and upload their own. A pack of 20 stickers are available on Amazon for $9.95. Barcodes are also available for free downloading on the Stickybits website. Stickybits launched this week at SxSW. When attendees at SxSW opened their schwag bags, among the various flyers, stickers and branded fortune cookies was a packet of Stickybits. People immediately set about tagging items around the convention center and uploading their own content to them. There are unlimited uses for information that can be attached, to branded items and otherwise. But like any user generated item, there’s also potential for clashing messages. Founder Billy Chasen ran Chartbeat.com, a real time analytics service that’s been “infoporn.” I caught up with Chasen at SxSW to talk about Stickybits and what he hopes to achieve with it. Everyone’s been talking about your company this week. How’s that feeling? of love has been great. We launched four days ago here and there have been some interesting use cases already. Someone attached a Stickybit sticker to a dollar bill to see where it would end up. Someone hid a coupon for his website in the convention center. Where did you get the idea for Stickybits? I came up with the idea last fall. I had this idea of wanting to attach virtual graffiti onto a wall. I was getting upset that latitude and longitude on QR codes weren’t accurate enough. It could tell me that I’m sitting here, but it can’t tell me about the chair or the wall that are right here. So we came up with the idea of stickers to figure out what is what. I pitched it to Seth Goldstein, who ran socialmedia.com, the Facebook advertising company. He loved it, and we started hashing out different use cases. What are you telling people to do with them? We wanted to build this so that it’s as open as possible. You don’t have to buy stickers, and can attach it to any QR code. You can download codes and attach them to random things. But we also knew that when you bring users in and say they can do anything with something, they don’t know what to do. Also, we wanted to give people some best use cases and solicit they were using it. All it does is turn QR codes into a unique number and let people attach new content. It’s user-generated content. Basically, the first person that attaches to the code is considered the moderator and can delete anything that’s added afterwards. Soon we’ll have ways for brands to manage their Stickybits. Right now we’ve launched the consumer model. What are some examples of use cases for Stickybits? There are coupons, special offers — the options are limitless. We’re hoping to see how brands will interact with these people. This is their best audience, they took the time to scan a code and add something to it. Our main goal in SxSW was to give it to everyone. There are 12,000 in the bags, and we’re handing out another 2,000 ourselves. We thought we’d launch and learn. I think it’s already proven itself. SxSW is what made Twitter, and Foursquare was a huge hit last year. Having such a concentration of the geek elite is really important. If they like something, they’ll run with it. That’s why we wanted to target this conference more than anything else. We put so much thought into what we wanted to do in SxSW. For a lot of companies, it’s an afterthought. There are screen cleaners in the bag and the like. So we wanted to do something that people will enjoy and have value. And people have noticed. Someone tweeted that Stickybits were the only thing of value in the bags. How about marketing? Are you working on anything beyond getting techies to use it here? Our main push was to get it into people’s hands. We have some things in store for later on. But the people here can definitely influence and understand a product. When Twitter launched, people were confused about what it is and why they would use it. The people who embraced it were these geek elite people – and they explained it in different ways to people who aren’t in this bubble. We have an easily explainable product, but people only get it by example. When I say this allows you to attach digital content to real world objects, they say: “What does that mean?” But then when they see it in action, they think it’s great. Do you need critical mass for it to work? The benefit of the product is that it works with both critical mass and the individual case. You can just use it to send a postcard. The use case can be one to one, or one to a few. Critical mass would be nice, obviously. But we don’t need it. What if a bigger brand starts hedging in with new QR code technology? We’re gonna make sure we’re doing that better than anyone else. There are tons of companies in QR space, but no one’s really gotten the fact that you should empower consumers to write. Just a seamless experience, what do you want to add. So easy. And when you scan it, it just starts playing. Can Augmented Reality be a commercial success for e-commerce? I’m going to stick my neck on the line and say yes…. each month on social networks like Facebook. 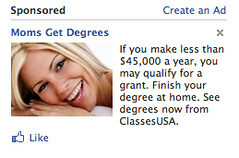 Facebook’s self-serve ads need work. But as long as they’re making money, they’ll keep getting better. Facebook is hard at work serving personalized advertising to its users, and the network’s popular self-serve ad platform is a big part of its planned $1 billion in revenue for 2010. But it doesn’t take a long visit to the site to see that those ads aren’t always on target. Today The New York Times looks at the ongoing problem of misdirected Facebook ads. Facebook’s platform is still relatively new, but its personalized approach to display is not always so personalized.